It’s that time of year! The time for gift guides! 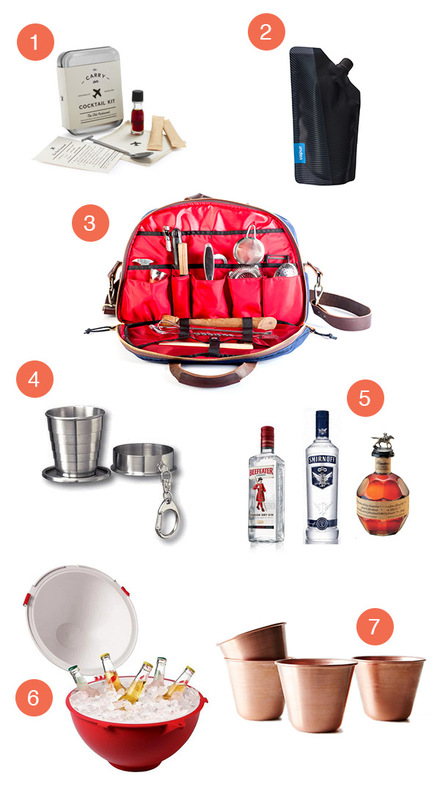 And this year we’re kicking off the holiday season with the best ways to transport your booze, your booze tools and whatever else you need to take your bar on the road. On a plane, or a train, or maybe even a lazy river, you never know where you’ll be when the need to make a cocktail strikes. Keep some nips on you at all times, and throw some extra in your bar case. On a plane? Well, don’t leave it to the crew to make you a drink, you know how you like your Old Fashioned. Don’t chance breaking some bottles while riding the subway- just pour your booze into a bag. Or if you must be fancy, pour a bit into your keychain shot glass. And when you do find yourself on a lazy river, there’s a cooler for that. Check out all the past gift guides here!